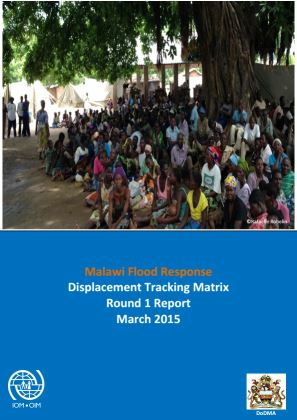 From 1 — 6 April 2019 IOM, in close coordination with the Government of Malawi through the Department of Disaster Management Affairs (DoDMA), conducted DTM Round II multi-sectoral location assessments in 103 displacement sites in Chikwawa, Nsanje, Phalombe, Zomba districts. 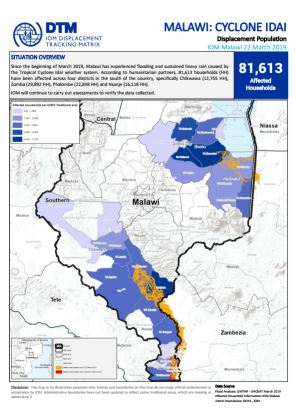 Since the beginning of March 2019, Malawi has experienced flooding and sustained heavy rain caused by the Tropical Cyclone Idai weather system. 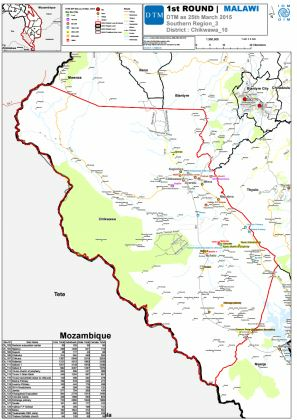 According to the Government of Malawi and humanitarian partners, there are 86,980 IDPs in 173 displacement sites in the affected districts. 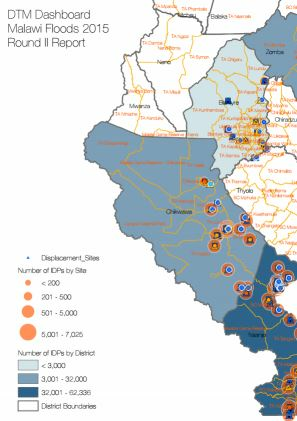 Site profiles conducted by DTM teams in Chikwawa, ​Nsanje, Phalombe, and Zomba districts from 26 — 31 March 2019 in 64 displacement sites. 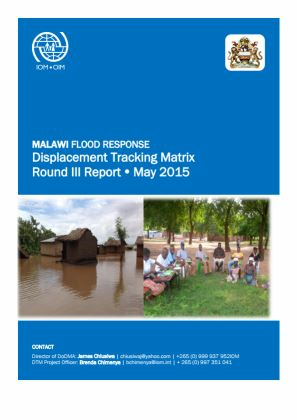 Since the beginning of March 2019, Malawi has experienced flooding and sustained heavy rain caused by the Tropical Cyclone Idai weather system. 131 sites remain open, corresponding to approximately 26,100 households and an estimated 107,000 individuals. 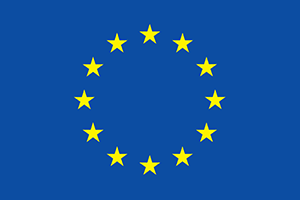 A decrease of 12,466 IDP households was recorded between the second and third round of the DTM reports; corresponding to a 32% decrease in the number of displaced households. 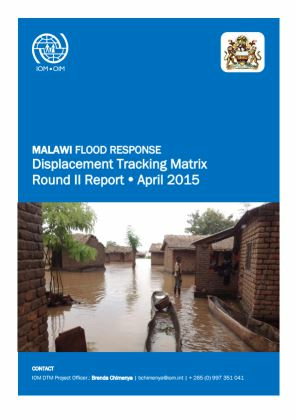 This dashboard of Round 3 indicates site type and location throughout Malawi. A table details site name, unique site ID (SSID), number of households, number of individuals and gender distribution of each site (131). An estimated 147,500 IDPs—approximately 38,600 households—are associated with 192 open sites. 8 sites (4% of the sites) host more than 1000 households. 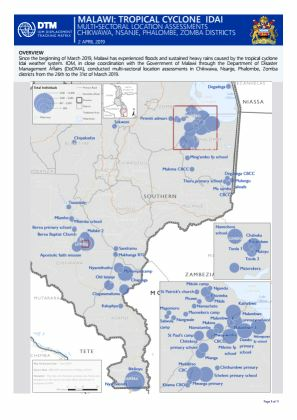 This dashboard of Round 2 indicates site type, size (number of IDPs) and location of sites across affected areas in Malawi. It further details shelter type, IDP origin, school attendance rate and water availability. 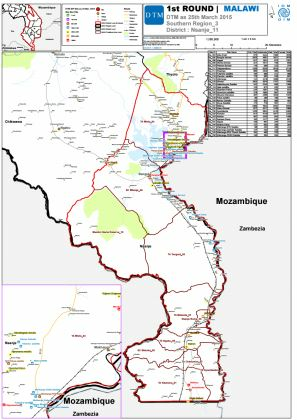 This dashboard of Round 2 indicates site type and location throughout Malawi. A table details site name, unique site ID (SSID), number of households, number of individuals and gender distribution of each site (192). 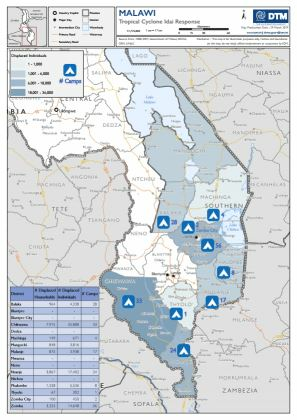 An estimated 162,000 people (approximately 40,500 households) remain displaced in 202 open displacement sites in in the Southern Region districts of Nsanje, Chikwawa, Blantyre, Mulanje, Phalombe, and Zomba as a result of heavy rains and floods that occurred in January 2015. 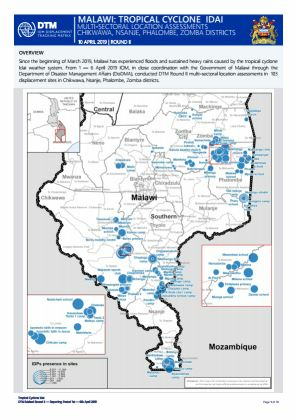 This dashboard of Round 1 indicates site type, size (number of IDPs) and location of sites across affected areas in Malawi. It further details shelter type, IDP origin, school attendance rate and water availability. 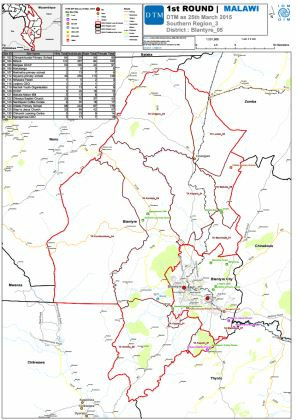 This dashboard of Round 1 indicates site type and location in Zomba district in the southern region of Malawi. 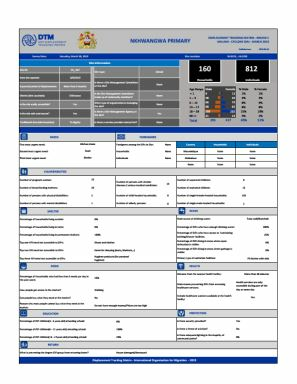 A table details site name, unique site ID (SSID), number of households, number of individuals and gender distribution of each site (49). 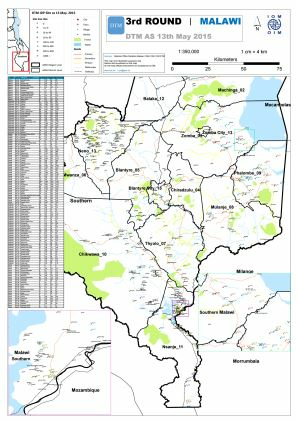 This dashboard of Round 1 indicates site type and location in Mulanje district in the southern region of Malawi. A table details site name, unique site ID (SSID), number of households, number of individuals and gender distribution of each site (15). 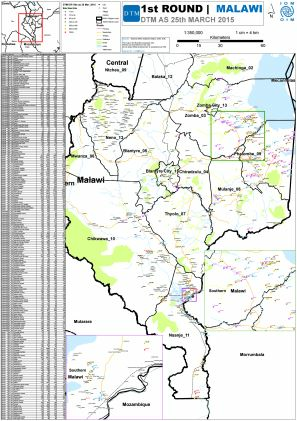 This dashboard of Round 1 indicates site type and location throughout Malawi. A table details site name, unique site ID (SSID), number of households, number of individuals and gender distribution of each site (203). 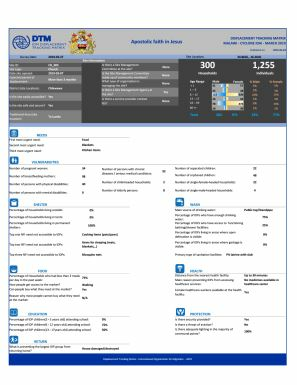 This dashboard of Round 1 indicates site type and location in Chikawa district in the southern region of Malawi. A table details site name, unique site ID (SSID), number of households, number of individuals and gender distribution of each site (23). 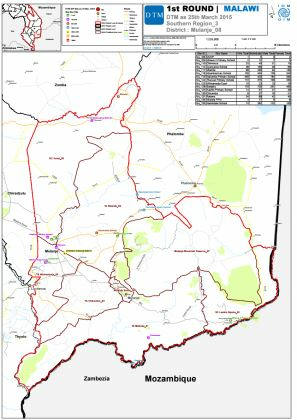 This dashboard of Round 1 indicates site type and location in Blantyre district in the southern region of Malawi. A table details site name, unique site ID (SSID), number of households, number of individuals and gender distribution of each site (17). 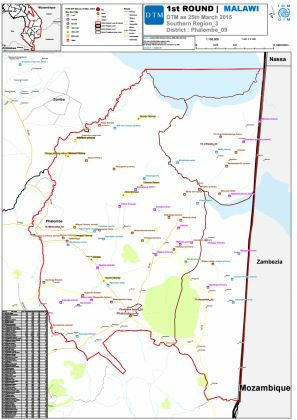 This dashboard of Round 1 indicates site type and location in Nsanje district in the southern region of Malawi. A table details site name, unique site ID (SSID), number of households, number of individuals and gender distribution of each site (31). 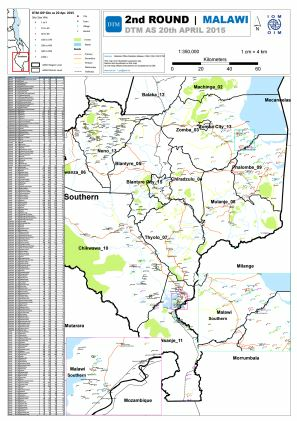 This dashboard of Round 1 indicates site type and location in Phalombe district in the southern region of Malawi. A table details site name, unique site ID (SSID), number of households, number of individuals and gender distribution of each site (62).